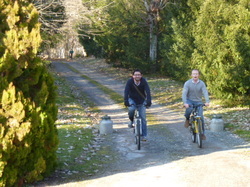 Walking, Cycling holidays in France - Domaine de France Gîtes, Chambre d'hôtes - Holiday rentals. Penne d'Agenais, Lot et Garonne, Aquitaine. We organize walking holidays to suit you and your group. You can walk daily or just do one or two walks during your stay. We will deliver you to the start, pick you up at the end or just leave you with a map and your sense of adventure. There are numerous well sign-posted walks (randonées) in this region from simple flat easy short walks to difficult rambles lasting all day on difficult terrain. The options are numerous, both urban and rural but mostly in very quiet untouched countryside. either self-catering gites (rooms for 2) where you can choose to cater for yourselves or let us help by providing meals, organizing restaurants or even collecting pizzas for you. or our house on a bed and breakfast basis, for that shorter stay. Let us know your requirements & we’ll quote you a price! We organize cycling holidays to suit you and your group. Tours can be daily or just once or twice during your stay. We will deliver you to the start, pick you up at the end or just leave you with a map and your sense of adventure. There are numerous well signed veloroutes in this region from simple, flat, easy, short rides for the inexperienced to difficult VTT rides lasting all day on difficult terrain. or our house on a bed and breakfast basis for that shorter stay. We can arrange bike hire and can even help with accommodation further up or down the valley and can transport your luggage from one stop to the next.